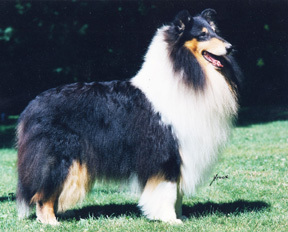 Blu Ridge Collies started in Massachusetts where some of the top collie kennels got their beginnings. 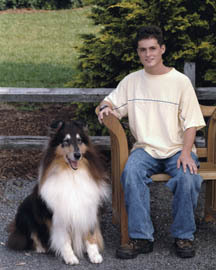 In 1993, we purchased our first collie, Starr's Light Starr's Bright, CDX CGC, TDI "Champ", (Ch. Starr's Risky Business x Ch. 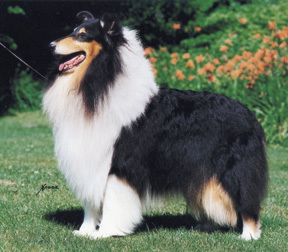 Candray Brillance) from Pam & Louie Durazzano of Starr's Collies and Dan Cardoza of Countryview Collies. "Champ" crossed over the rainbow bridge Feb. 2007 at the age of 13 1/2 - it has been a pleasure to own such a wonderful collie. In 1995 we purchased our beautiful "Ricky" - Countryview Monumental. (Ch. Starr's Tailor-Made x Countryview Starr Search) Bred by Dan Cardoza & Pam Durazzano. After obtaining his CGC and TDI titles we went on to show him in conformation. "Ricky" earned his Championship in 1998. When we think of the perfect collie, we will always think of Ricky. He exemplified the standard with his light head, beautiful arch of neck, flowing movement and an expression that would make you melt. He was as majestic to us as the Blue Ridge Mountains. "Ricky" trained us on how the standard should be read and is a major influence on our breeding program today. "Ricky" left us at the age of 13 1/2 in April 2006 and will always be missed. We are active members of East Tennessee Collie Club, Piedmont Collie Club of the Carolinas, Collie Club of New England and the Collie Club of America. 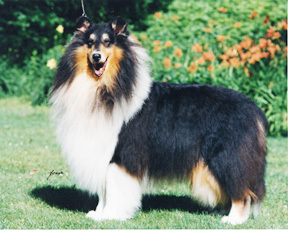 We pride ourselves in breeding proud, happy, and healthy collies who are athletic and quite adaptable. web site see that "Ricky" represents the rough collie breed.